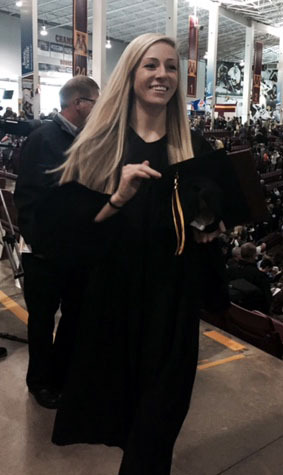 My niece Jenna graduated from the University of Minnesota Carlson School of Management today. Next up, law school this Fall. To see the hope, enthusiasm and optimism in these kids’ eyes makes me feel like a kid again. Ready to commence, begin and begin again, to never stop learning, growing, embracing and engaging in each day to the fullest extent. The past few months has been filled with a lot of challenges, of “real” life. For a few hours today, the roller coaster hit the high point. Instead of lamenting the “reality” that experience brings, I’d rather tell these young people (and not so young people) to never give up or be defined by another, believe AND work for your dreams and let faith, kindness and love to be your GPS through it all. Commence. I asked Jeanne to teach me how to do speed work so I could mix up my running routine, making it a little less routine. It’s easy to get into a rut even in good habits. Tonight, she taught me and made it fun. There are many more lessons I’ve learned from her through the years. She’s magnetic and draws people to her with who she is to the core. Jeanne will often say she’s a follower not a leader. It could not be farther from the truth. Authentic leadership is unselfish, shining the spotlight on others. Authentic leadership shares knowledge with actions more than words, with genuine enthusiasm more than pontificating. Authentic leadership is ego-free and generous in spirit, actually making us believe that we know more than we do, building our confidence to keep trying. So when I look for models of leadership, I am certainly not looking at those in politics, entertainment or most businesses. Real leadership is modeled by those in our daily lives who quietly, unassumingly and authentically live it out each day, reaching outward rather than calling attention to self. Natural and real, building others rather than themselves. Outstanding lesson in not only speed work, but authentic leadership in so many areas of life – thanks Jeanne, your grateful student.